Tag Archives for " X-keys "
Ross Brand with your Livestream Universe Update and Flash Briefing for Thursday, May 3rd, 2018. The latest version of Telestream’s award-winning live video production and encoding software is available. 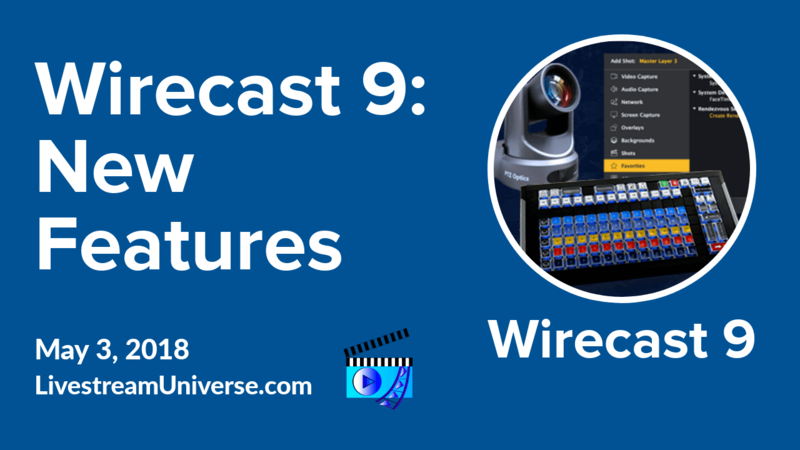 Wirecast 9 has several new features. A few of the standouts are a brand new custom controller from X-keys, a faster and more convenient way to stream to Facebook pages, and Facebook Live comments. The pro version also includes remote control of PTZ Optics cameras. More information on Wirecast 9 at LivestreamUniverse.com/Resources. At 1pm ET, RJ Redden of Black Belt Bots will discuss Day 2 of the F8 Facebook Developer Conference, focusing on topics related Messenger Bots. View on the Black Belt Bots Facebook page. At 7pm ET, it’s time to Shop the Show! Join us for Livestream Deals. Guests include Tiffany Yarde, who will talk wine and your career, Julia McCoy will discuss Content Strategy, Eddie Garrison shares some Facebook Live tips and RJ Redden has a special offer to help you get started building messenger bots. That’s 7pm ET on the Livestream Universe Facebook page.